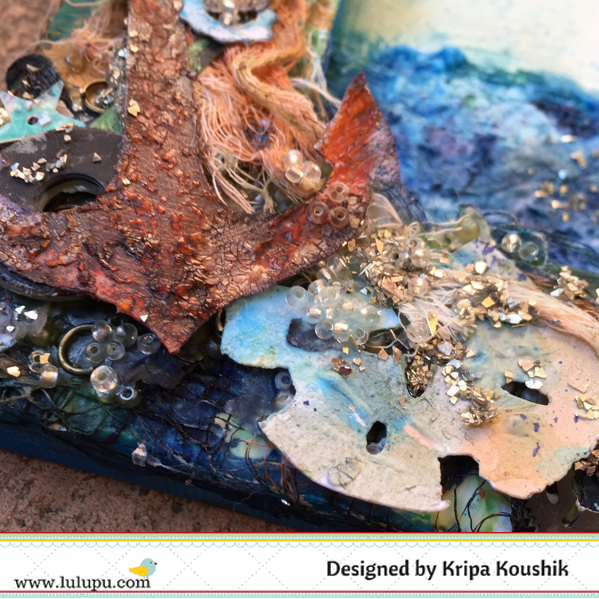 Neha here, and this time I am sharing with you a mixed media card along with a pictorial. I love doing mixed media and generally I make layouts or canvas using it but for the first time I am doing a card. Here is my card. The central panel on the card is done with a no. 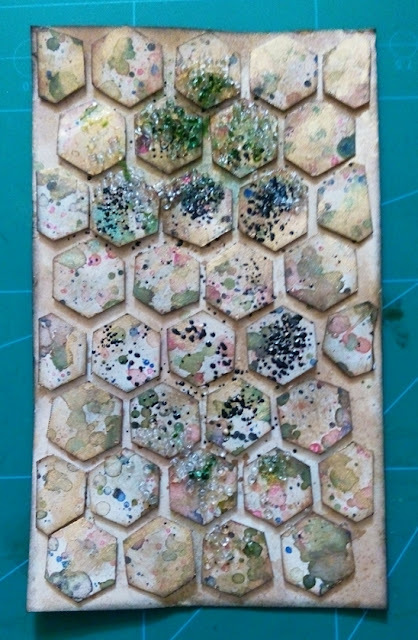 of small hexagons placed over a CS (sprayed with LSG spray) using foam dots. 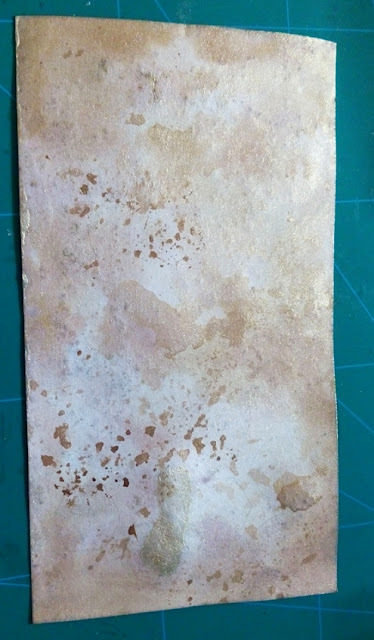 For the base I took a white CS and matted a PP from Prima epiphany collection over it. Added some lace on both sides of Hexagon panel and matted it over pp panel. Lets see how to make this. 1. 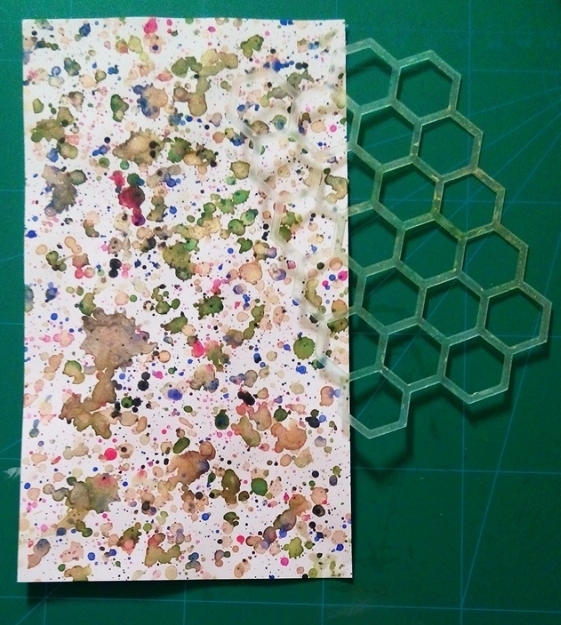 Take a piece of CS and splatter different colors from LSG sprays and other paint. Cover all white spaces. Let it dry. 2. After drying use a stencil to trace the shape with a pencil. You can use any stencil. 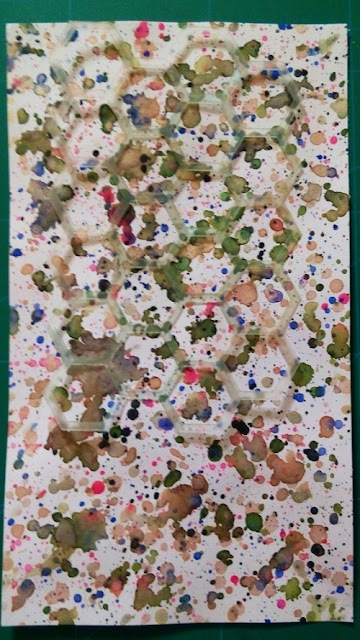 I used here honeycomb stencil. Now cut the shapes. Cut as many as you need to cover the panel. 3. Distress the edges of hexagonal shapes and a white CS over which you will place them with vintage photo DI. 4. Color the CS with LSG sprays. I used here Glory of the seas gold. 5. 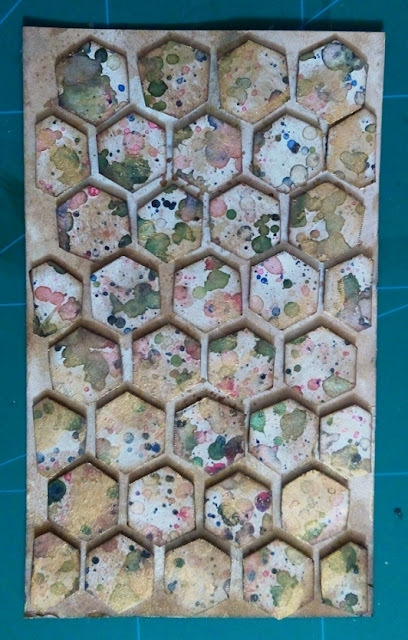 Now place the hexagons in a pattern over the CS using foam dots to add dimension. Add some gold paint using your fingers. 6. Heat emboss some chunky black embossing enamel. 7. Spray some more color, splatters of pink and black paint and add some glass beads from Prima. Next add some piece of lace on both sides of the above panel. 8. Now take a piece of white CS which will form the card base and mat a pp over it. Glue the hexagonal panel in its center. 9. 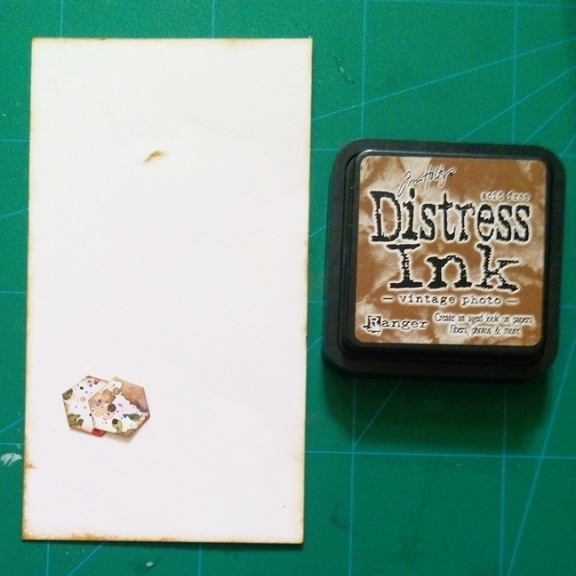 Distress the edges of pp with vintage photo DI and soften the look with gesso. Add some gesso over lace also. 10. Embellish the card with net, Prima wire thread, Prima flowers, leaves, wood veneers and charms. Splatter some black paint, on the edges of hexagons and your card is ready. I am happy the way it came out finally.What do you think. Let me know. Do take part in our current challenge here. Dolly here! How are you all doing? Are you enjoying the weekly creative dose shared at Lulupu. If not, please hop onto the site to check out some amazing stuff happening this month. Our talented DT's are sharing lovely techniques and inspiration throughout the month. This month's Challenge-50 is all about the beach holiday/ summer splash! So link up your projects for a chance to win a lovely hamper from Lulupu. 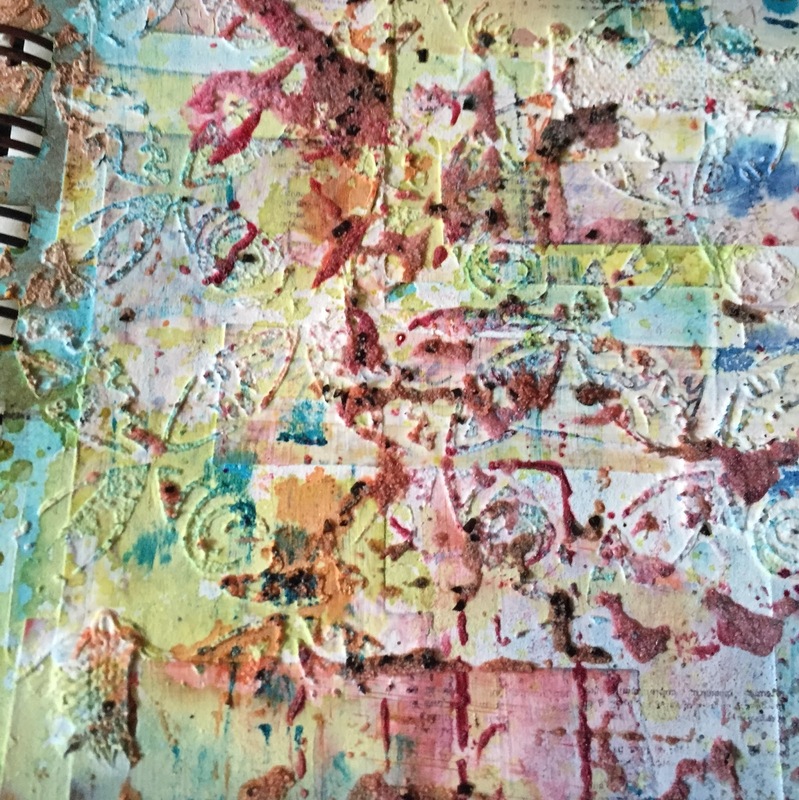 This week, I have created a mixed media canvas with the help of some gesso, tissue paper, embossing paste and lovely ink sprays from dylusions and distress inks. 1. Coat the canvas with a thin layer of gesso. 4. Add color using any ink sprays, in my case, I have used Lindys Startburst - Down the rabbit hole, Rangers Dylusions in Lime Green and London Blue. Lets the inks spread and use heat gun to dry. 5. Using gesso with stencil, I have added some more texture in the focal area where my sentiment will be placed. 6. Added some random circular designs with distress inks sprays - brushed pewter. 7. For the sentiments, I have hand written the words in small pieces of cardstock which was given a border with black marker. 8. I have also used wood veneers which have been painted gold and glossy accents drops to embellish the project. I hope you have enjoyed the step-by-step guide! Thanks for stopping by! Neha here, I hope you are enjoying this month's theme. All the details about our current challenge can be found here. 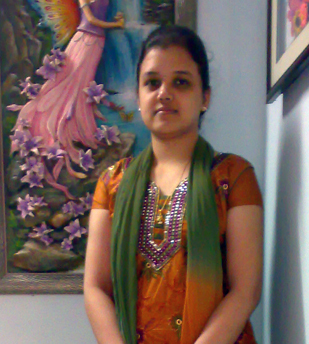 This month we have Kavitha as our guest designer. Her style is shabby chic which is her favorite too. So Lets hear about her and then head over to see the inspiration she has made for us. I always wanted to do something related to designing n creativity and wanted to do it on my own,so crafting gave a way for everything I dreamed.While browsing i came across blogger n started a blog , I was not even aware of art blogs those time (around five years back ), I just wanted to try it for fun.Initially I was just sharing my previous works,but when I came across some paper craft blogs n challenge blogs I become really hooked up, n started blogging regularly. First n foremost is a trimmer,I cannot cut it straight with knife or scissors :) n I love using dies n lots of flowers n ribbons in my projects. Mixed media,there is lot of freedom with mixed media which I love very much and it gives me a chance to use my painting skills a bit which I miss after started with paper crafting. I love adding layers n dimension and depth to my projects.I also love to do trendy n stylish cards. I dont have any one in particular but I have a long list of favorites whose work I love to see.I mostly follow mixed media artists. Haha of course browsing through internet. Mini albums n some layouts. Thank you Kavitha, it was so nice reading about you. So now lets checkout what she has made. Today I am sharing a shabby chic layered card which is one of my most favorite style. I layered two pattern papers,both distressed on the edges n added some white gesso. Then I added some layers of tulle n seam binding ribbon for giving dimension to my flower arrangement.Then I arranged some mulberry flowers n resin pieces. I added a little bit of gesso for the whole arrangement to give a shabby look. Hope you liked my card,sorry I couldn't make a tutorial this time,but if you have any doubt please feel free to ask in the comment section,see ya:). Wow, Kavitha I loved this shabby chic card. Loved the arrangement of Tulle, ribbons and flowers, so shabby!!! So guys! there is still some time left to enter the challenge!!! You can link your entries here. Hence as my second post, I get to introduce some cute things that I'm currently working on or something which is close to my heart. Here's the alphabet monogram I recently made. 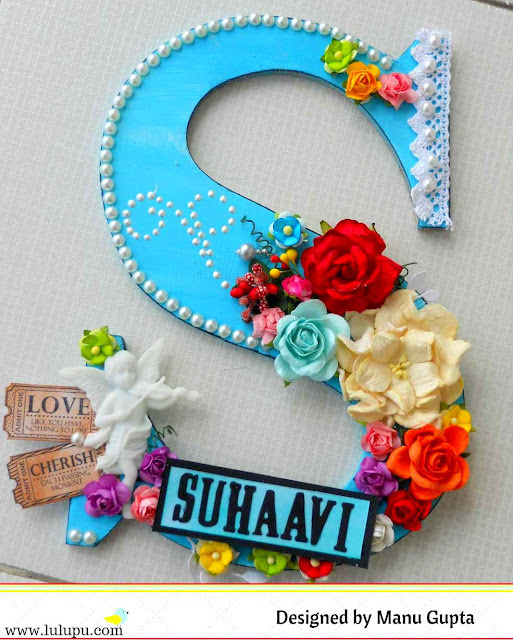 I love these for the fact that they make for a trendy wall art as well as serves the purpose of a nameplate as well. This is something that I make for kids. Well, I guess you might have already guessed that I'm kind of more inclined and biased towards the blue (and blue+ yellow) combination of colors. My last couple of creations showcased here are all based on these color combinations. But then, I love these colors, they make for a very vibrant and colorful combinations. The base MDF alphabet is given a coat of primer and then colored in the blue shade and the edges are given a distressing of the black color to highlight them a little. And then comes the time to embellish it all to your hearts content! Here are a few more close up's of the monogram. 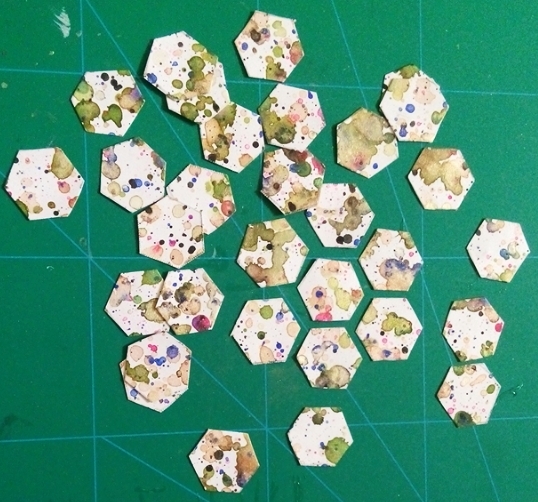 I love this particular resin embellishment for the basic fact that they are cute and apt for a kids project and super cool tooo. And it's not hard to guess that flowers are the next best thing that I love. There's hardly a project that I make without their use. And why not to use them, they make the projects look lovely afterall. I hope you like this altered art and would love to give it a try too! Do checkout our this months challenge which is all about beating the heat with cool Summer splash(s) and also Neha's cool project and a tutorial on how to make a lighthouse!! That lighthouse is seriously soo cool. Do link up your entries here. Hi all, this is Tanvi wishing you all a very good morning! To begin, prepare your background with the medium of your choice. I have used glimmer mists & distress inks on two different pieces. 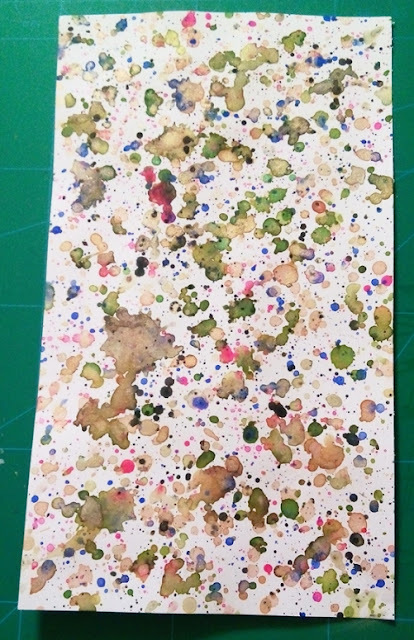 TIP - heavy weight card stock/ water color paper for best results. You will need a circle template which can be easily made one with circle dies. Next, create random circles using white pigment ink with your template (TIP - begin with the larger circle). Have fun as you see the visually appealing bokeh appear! Its that simple! I loved the bokeh technique on this card but unfortunately capturing this one on camera was difficult! I hope you are tempted to try this! 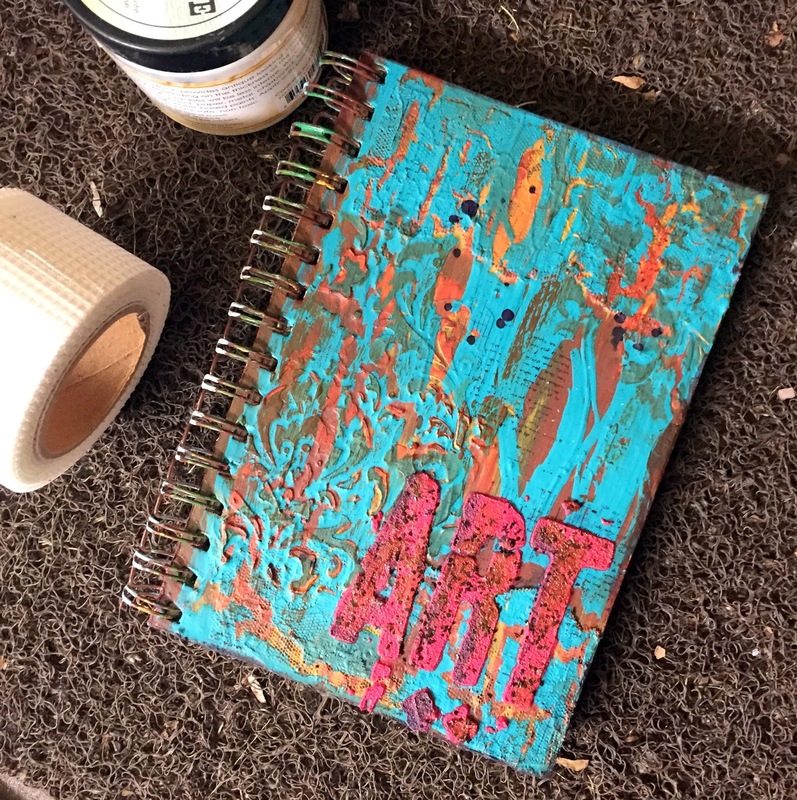 This my friends is one of my Art journals, the one in which I experiment and try out different products, colour , media combinations and techniques and that's why it stays behind the scene. Days when I don't have a project in progress, these pages are waiting to be experimented on. Experimenting means there is no pressure to create anything that's picture pretty, no restrictions, just one ground rule - enjoy the process. This also means there will be no cringing when a technique doesn't work out or when several colors pool together and result in a black mess. After filling up nearly half the book, finally altered the cover of the journal this weekend. I first sealed the chiupboard cover with gesso and then went to town with a whole heap of media - texture paste through stencils, mists, sand texture, glass glitter and finally stamping with archival inks. 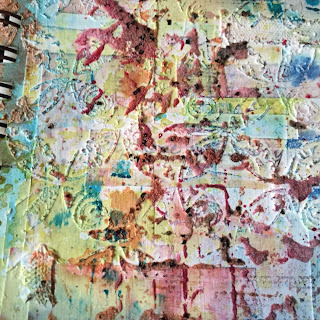 Here is a peek at one of the inside pages - texture paste applied through cling wrap; overheated gesso so it bubbles, glass glitter + gesso through stencil and the list goes on. I hope you find some crafty arty time this week and try something new. 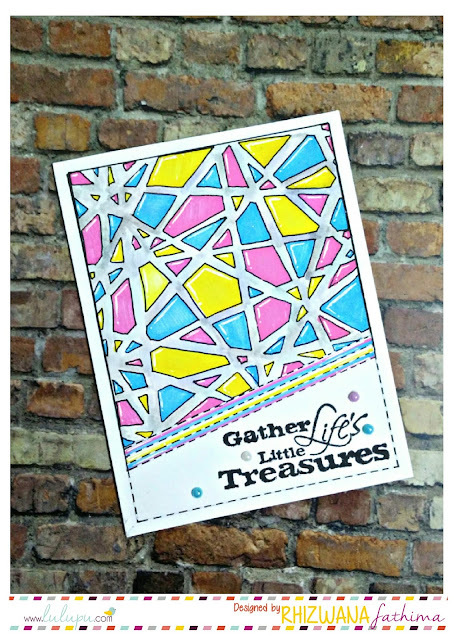 Don't forget to have a look at our challenge this month: Summer Splash and link up a project to win some goodies. Dolly here today, I am popping in real quick to share a couple of cards I made for this month's beach theme. We have some entries lined already and you still have loads of time to be inspired and create anything which goes along with our theme. 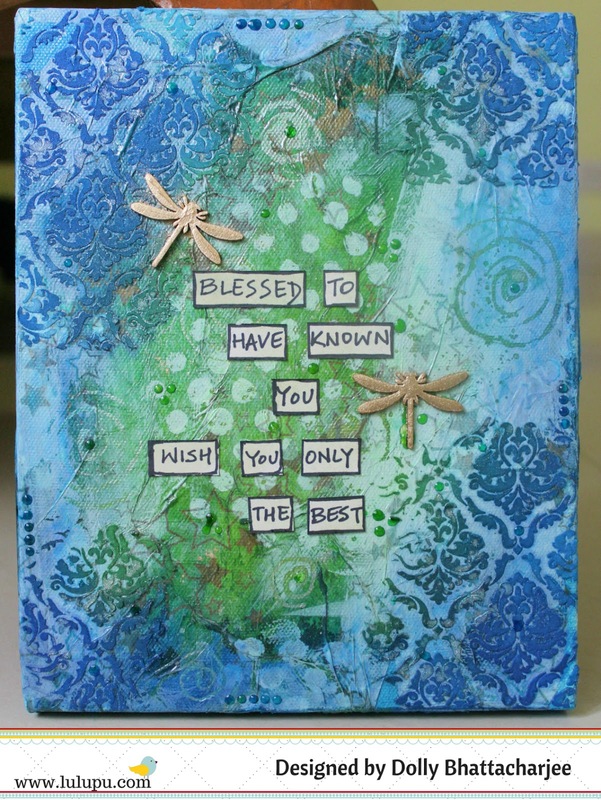 For my first card, I have used watercolors to create the background in shades of blue and stamped the cute fishes along with the sentiment. The hearts are hand drawn. To complete the card, I have used some twine. For my second card, I tried making waves of the sea using different colored papers by just tearing them with hand. 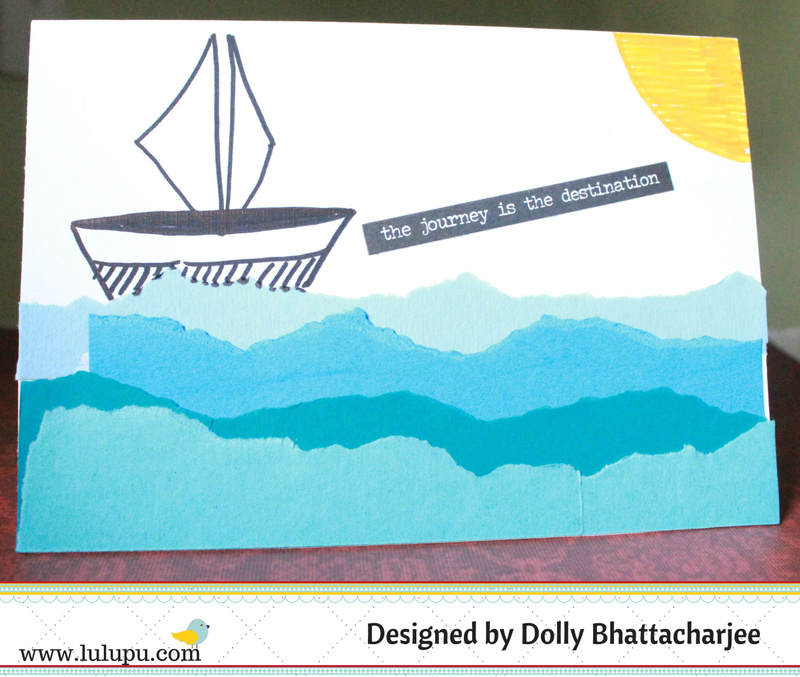 I layered them on the main card and hand drew the sun and the boat ( felt like a small kid at school). The sentiment added was from Tim Holtz - small chat. 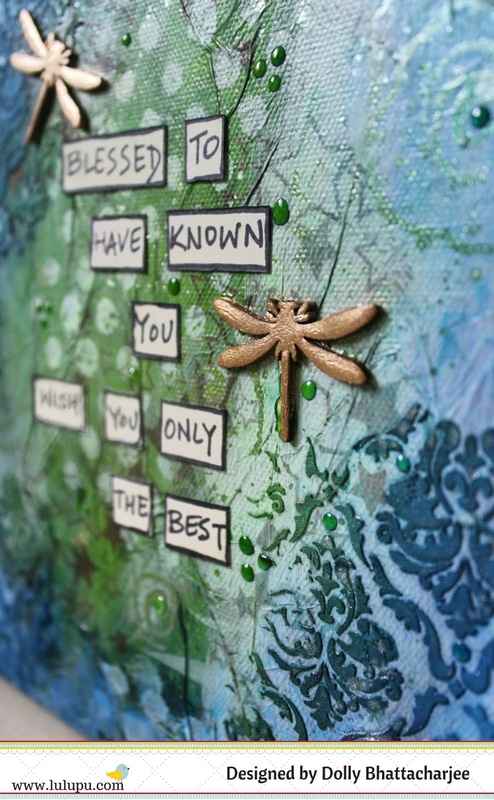 For the third card, I used an embossing folder from Tim Holtz to create the background. The flag banner was hand drawn and colored. 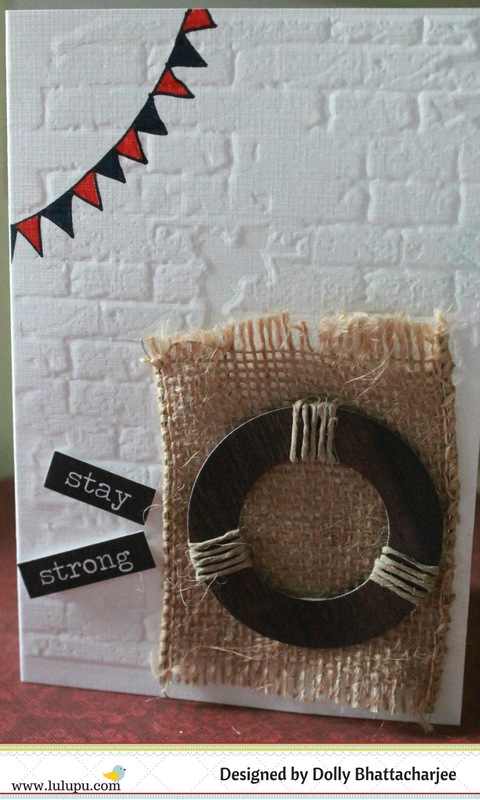 I used some wood patterned paper from My minds eye to create the lifesaver ring which was placed on a jute patch. 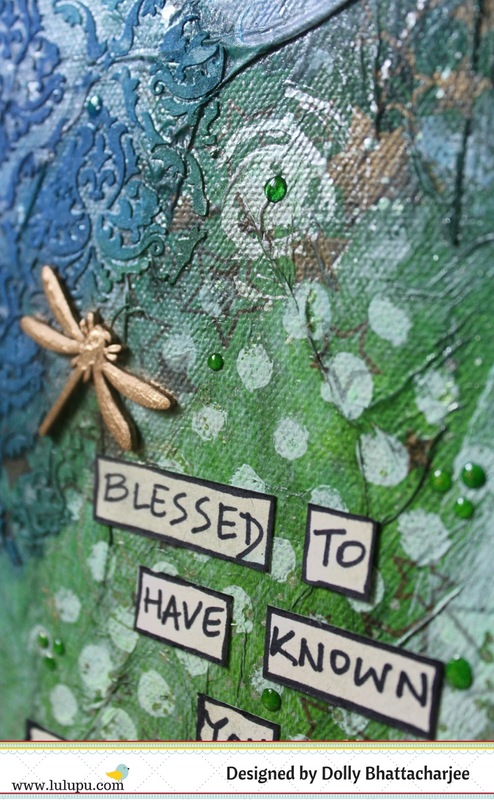 The sentiment is from Tim Holtz again. 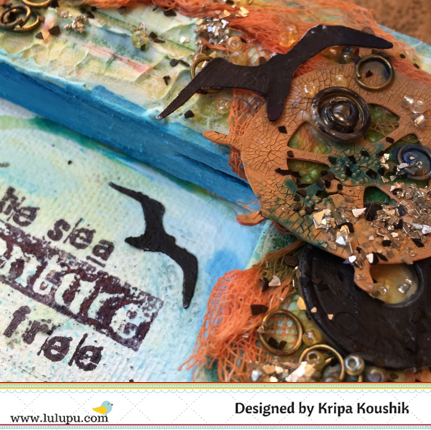 Pop up Box card: Inspired by the sea! This is Manu here with my take on this months challenge! The Summer season has been a smashing one here in the Northern area with the sun at it's peak, and the only respite one can feel is a real summer splash!! and what's better than a summer splash theme here at the Lulupu blog. I interpreted the theme keeping in mind the heat and a beach is the best way to beat the heat!! Yes, I have a it'a-all-about-the-beach card for you and needless to say, I loved the way this one came out to be. Here's what I made! Yes, it's a POP-up card and I love them, to bits!! They are soo much fun to make and the wow factor associated with them is amazing!!! The most amazing thing with this card is that it can be folded flat to put it inside an envelope and send it and when opened up, it pops up into a box shape, this is one 3D card which I truly love. Versatile and full of sparkling goodness! I have a tutorial on how I did this one and lets check it out! (A lot of tutorials are there on the internet for this card, but I tweaked this a little to suit up to my dimensions). 1. Take a 15*9 inches cardstock and score it at 4", 7", 11" and 14". Now invert the cardstock on your Martha Scoreboard and score at 4". 2. Cut off the 1" piece with the Tonic Scissors from the side you choose to be the top portion of the pop-up box as shown in the pic. 3. Now fold this cardstock to form a box shape and glue using the Tacky glue the left over 1" portion with the other end of the cardstock. You would get a a pop-up box in this shape. Take two one inch stripes and paste them inside of the box as shown, these strips will be used for the placement of different embellishments. 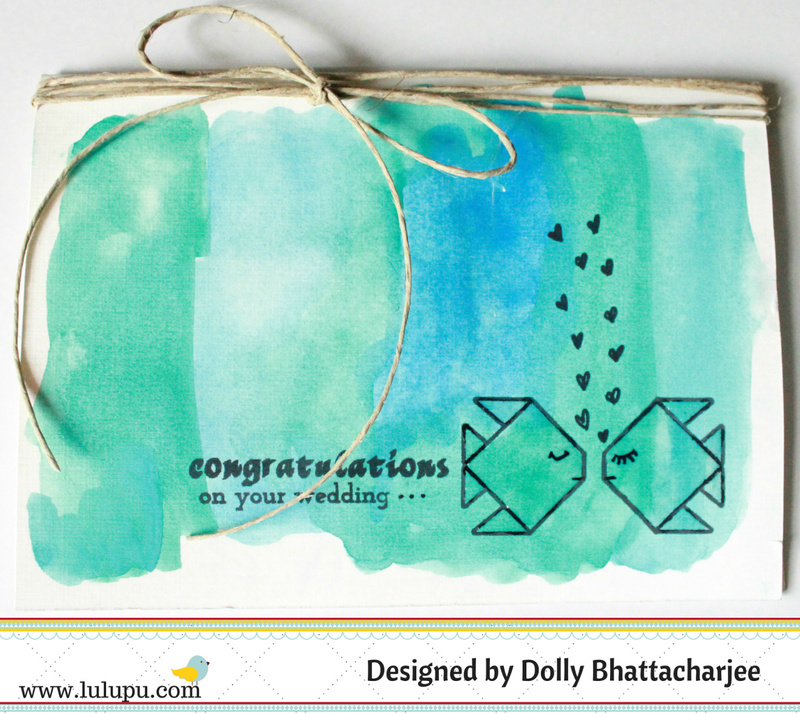 Now choose your pattern papers and as per the dimensions of the pop-up box, cut them out and stick on to the card. 4. Now comes the turn to embellish the pop-up box card to your hearts desire and this is what I did. I loved the way this pop-up box came out to be. Such a bright, chirpy and all bluish card! Don't you loved those blue ocean waves?? I had fun making those! The Lawn Fawn stamps sure makes this card a pretty one!! Lawn Fawn is one brand which I truly love! Here's the view of the card when folded up! And a fold the other side! All these critters are colored with Normal markers and The Copic's are in my yet-to-buy list and I'm sure I'll soon lay my hands on those! I hope you all liked my take on the current challenge!! This is one sooper one and there can be soo many interpretations, and what more, you can always choose from the beach or the nautical way to express out those lovely creations. Do not forget to enter your creations here, and also do let me know if you liked my interpretation of this months challenge! This is Tanvi here with my take on Challenge#50. For my inspiration I decided to go make a card with the "beach" theme. To create the sand texture I added a few drops of Vintage photo reinker to DecoArt Texture sand paste, very happy with the outcome. Do you agree? The shaker element of the card is the sea. For this I sprayed a piece of CS with LSG starburst Blue Hawaiian Blue & let it dry. I randomly stamped dotted curves to create the waves (Colorbox Aqua). Some adorable sea creature charms I had in my stash were perfect creatures for the shaker! And finally this is the full reveal of the card! Hope I have inspired you today to participate in the current challenge! Hope to see your creations soon! For a while, Ive been wanting to create something about my favorite affirmations. One of them is the subject of my canvas today. Its very easy to get frustrated and run down by a sea of emotions resulting from the challenges life throws our way. But, if one takes a different perspective, from the same set of events/ challenges will arise inspiration, balance and inner peace. Happiness is a choice, not a result. 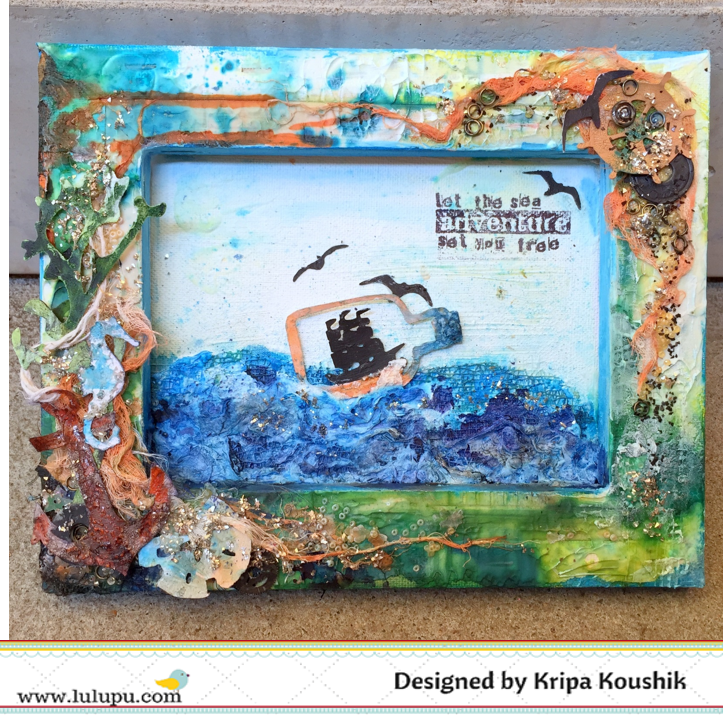 Ive interpreted Summer theme with the waves of the mighty sea and a ship in a bottle! Cant imagine making a project without my Silhouette Cameo. All the shapes - anchor, seahorse, sea weed, ship in a bottle, birds, sand dollar and a few other random shapes have all been cut with the Silhouette machine. The background has lots of texture paste, sand texture, gesso - black and white, crackle paste and a variety of fabric, mesh, tissue paper. There were a dozen techniques used to create interesting texture, here is one : apply a fairly thick layer of texture paste. Stamp into it when semi dry. Remember to wash your stamp immediately. Ive stamped Kaisercraft texture stamps and Tim Holtz embossing folder to create patterns in the texture paste. Scroll down to read all the supplies from the Lulupu store used for this project. Our theme this month can be interpreted in many different ways. Click here to read all the details. I hope to have inspired you in someway today, look forward to seeing your take on this challenge. Flutter Texture Clear Stamps 2"X5"
Arty Texture Clear Stamps 2"X5"